A ship unknown to most cruisers, Semester at Sea’s 24,318-ton Explorer, is presently doing the rounds in Europe, under sponsorship of the University of Virginia. Starting with a stop in Galway on August 31 and an overnight stay in Dublin on September 2, she spent September 5 to 8 in Southampton and the 10th-15th in Antwerp. Leaving Antwerp on Saturday, she is now en route to Lisbon, where she will stay from Wednesday till Friday, and Cadiz, from Sunday to Wednesday next week. Something one will notice from these dates is how many nights are spent in port. In Europe this month she will have one overnight stay, three three-night stays and one five-night stay. And this will be followed by three-nights in each of Casablanca and Tema en route to Cape Town, where she will spend four nights before returning via South America to Fort Lauderdale, where the present cruise ends on December 7. These longer stays allow the students on board to travel and learn more in depth about the locations they visit than a typical eight-hour cruise ship stay allows. This itinerary is part of a 107–night cruise that started in Halifax on August 23, one of her longer voyages on which university students can earn credits towards their degrees by studying in foreign countries. Port-to-port passengers are also free to join these cruises and special per diem fares are available for such transits, as for example Cape Town to Fort Lauderdale. The Explorer’s next such voyage will be a 106-night world cruise sailing from San Diego, California, on January 7, 2013, and calling at Hawaii, Yokohama, Kobe, Shanghai, Hong Kong, Ho Chi Minh City, Singapore, Rangoon, Cochin, Mauritius, Cape Town, Tema and Casablanca and finishing in Barcelona on April 25. Next summer, on June 17, 2013, the Explorer will offer something she has not offered before, a 66–night round trip Mediterranean cruise from Southampton. Calling on Casablanca, Tunis, Alexandria, Istanbul, Piraeus, Marseilles, Livorno, Civitavecchia and Barcelona, this voyage will also include many three- and four-night stays at different ports of call. While outside passengers can book these programs, the Explorer also offers a product called Enrichment Voyages, which are exploration cruises that are more generally available to the public. The next such voyage is a 25-night cruise that covers both Christmas and New Years. 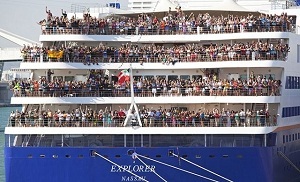 Called “Origins and Empires,” it will start in Nassau on December 8 and make its way through the Panama Canal to San Diego, where it will finish on January 2, 2013. Ports of call include Montego Bay, Cartagena, Colon, a transit of the Panama Canal and then Guayaquil (Ecuador), Callao and Manta in Peru, Puntarenas (Costa Rica), Corinto (Nicaragua), Puerto Quetzal (Guatemala) and Cabo San Lucas.